Dr. Daniel Santisteban is a Professor in the Department of Education and Psychological Studies at the University of Miami. He is a licensed psychologist and his more recent program of research has led to the development of an adaptive and evidence-based family therapy called Culturally Informed and Flexible Family Based Treatment for Adolescents (CIFFTA). CIFFTA eschews a “one size fits all” approach, creates a process for tailoring the treatment to the unique adolescents and family cultural and clinical characteristics, and includes decision rules that will allow the treatment to be replicated. 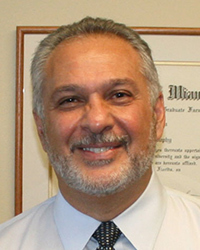 Dr. Santisteban has been the recipient of six NIH clinical research grants to develop and test enhancements to family treatments for special populations, a grant from the American Suicide Foundation, and more recently a SAMHSA grant to provide training in Screening Brief Intervention and Referral to Treatment. Gattamorta, K. A., McCabe, B. E., Mena, M. P., & Santisteban, D. A. (2016). A Latent Profile Analysis Investigating Factors Impacting Latino Adolescents’ Attendance in Treatment. The Counseling Psychologist, 0011000016642843. Stanforth, E. T., McCabe, B. E., Mena, M. P., & Santisteban, D. A. (2016). Structure of Problem Recognition Questionnaire with Hispanic/Latino Adolescents. Journal of Substance Abuse Treatment, 71, 36-40. Santisteban, D. A., Mena, M. P., Muir, J., McCabe, B. E., Abalo, C., & Cummings, A. M. (2015). The efficacy of two adolescent substance abuse treatments and the impact of comorbid depression: results of a small randomized controlled trial. Psychiatric Rehabilitation Journal, 38(1), 55.